Many massage chair models may pretend it has got it all. Not not mention that most of budget massage chairs on the market today have the appearance of luxury equipment that provide the best massage with a human touch experience, but in reality lack in even basic features. A few selected brands were able to offer a premium features even in it's cheaper models to attract the potential customers. 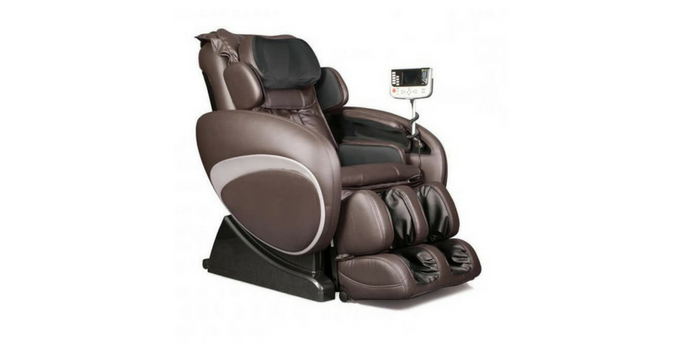 Osaki massage chair brand packed a few great features in some of it's models. That’s why we decided provide you with the Osaki OS-4000 massage chair review along with a quick comparison of Osaki's other models. Osaki massage chair brand may sound familiar to you. We will look all the features and the drawbacks of one of the most popular and best rated massage chair. And for the full overview of Osaki models, read our guide here. Affordable and packed with special features, could the Osaki really have it all? A popular massage chair brand, Osaki OS-4000 has a selection of four different models with features that vary from model to model. The massage chairs offer numerous features. Either for a more serious user to an occasional hobbyist, the Osaki OS-4000 is highly functional for the price range. There are four different Osaki OS-4000 models, with OS-400 being the cheapest. We’ve included a list of features for each model as well as their downsides. Of the four 4000 Osaki models, this one is the most popular one. On the low end of the Osaki price range, this massage chair offers quite a lot, but at the same time, the S-track design might not be too appealing to some. 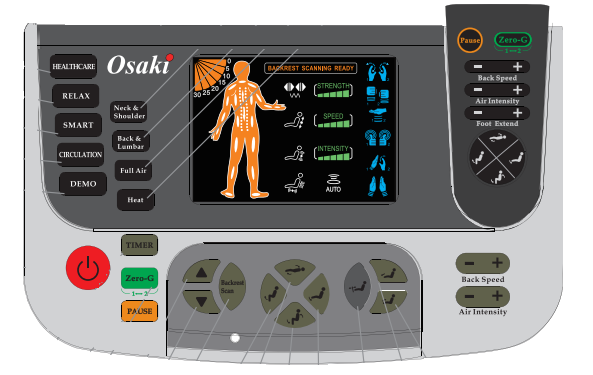 Osaki OS-4000 comes with airbags in the arm, shoulder, hips, lumbar, feet and calves’ areas. The air massage is a quite common feature with low-budget chairs. Two levels zero-gravity, a very beneficial feature because it enables a more thorough, deep tissue massage. It relieves the pressure from the spine and helps muscles to relax. Automatic leg scan feature means that the massager automatically adjusts according to the legs of the users. This makes for a more intense and thorough leg massage. This feature is not available with the Osaki 4000LS AND 4000CS. Heat therapy is provided for the lumbar area only with all four models. There are eight pre-set massage techniques: circulation, healthcare, smart, relax, demo, neck and shoulder, full air, and lumbar. With 6 massage styles (Swedish, Shiatsu, Kneading, Rolling, Tapping, and a combo) Osaki is quite extensive in what it offers. The users can choose from five intensity levels and five different massage speeds. An additional touch is a manual mode function, which enables users to combine their ideal massage by choosing from the style, speed, intensity, and massage duration. There are two remote controls for the OS-4000: a full-size remote control with an LCD screen and a small wireless hand-held remote. The two remote controls come only with this model and the Osaki OS-4000T. An automatic timer is a safety feature. When the user sets the timer, the chair turns off automatically if the user falls asleep during the massage. The OS-4000 weighs 214 lbs. And it’s recommended for people up to 265 lbs. And 6 ft. tall. Everyone who’s higher than this might not be accommodated very well in the chair. This massage chair has all the same features as the previous model, but it comes with an additional upgrade. 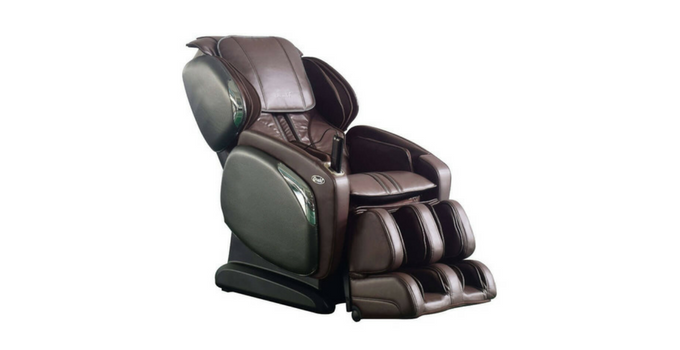 Apart from the airbags in the feet and calves’ area, this massage chair also contains two rows of massagers which provide a deep foot and calf massage. This is a plus for anyone who spends a lot of their time on their feet. This feature is available only with this and the next model, Osaki OS-4000LS. The chair weighs 214 lbs. And is able to accommodate users up to 265 lbs. The Osaki OS-4000LS has similar features to the previous two models, but it comes with a few extras and a few changes as well. One of the most important difference is perhaps the L-track design. While the S-track is not too bad and it provides a solid massage, the L-track follows the spine from the neck to the glute area, covering a much wider surface than the S-track. 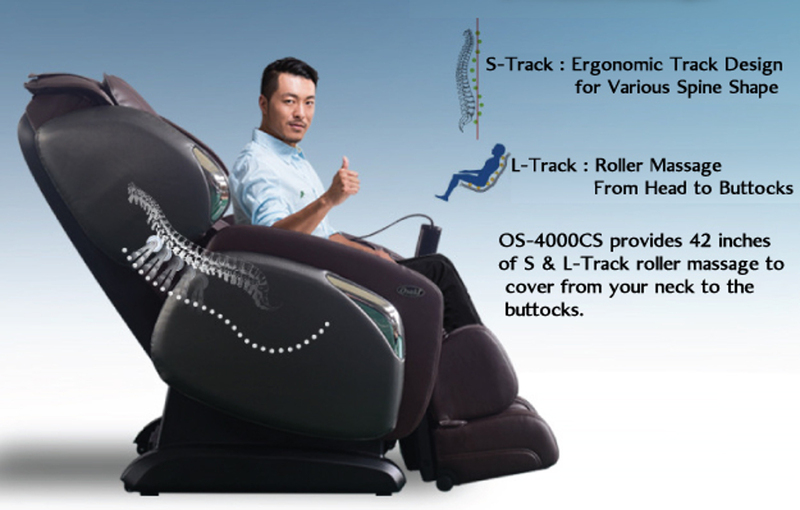 The L-track feature is available with this and the OS-4000CS massage chair. The OS-4000LS has an ability to adjust the width of the shoulder massage. It offers three width options to accommodate more users. This feature is available only with this model and the OS-4000CS. Another welcome addition to the OS-4000LS is the space-saving technology. This can be a big plus for all those who have limited space. This massage chair is very efficient space-wise. All you need is 4 inches of space behind the chair for it to recline fully. This Osaki massage chair comes with a LED-screen remote instead of a full-size controller, but it is easy to use. This way the users can adjust the massage while they’re in the reclined position already. There is no leg-scan technology as with the first two massage chairs, but it has a spring-loaded ottoman, which is able to adjust to the users. A deep tissue massage is a feature normally available in zero gravity position. 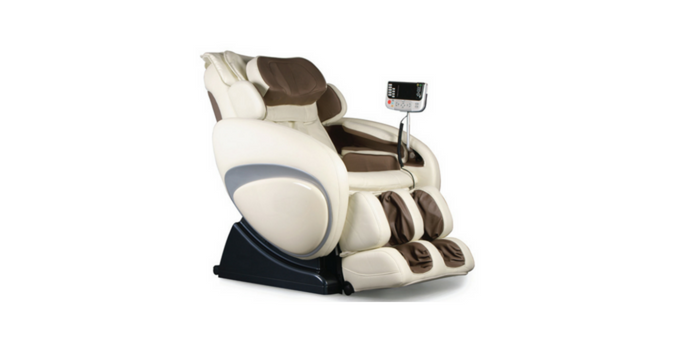 But OS-4000LS has a deep tissue massage pre-set program without any reclining required. The chair weighs 272 lbs. And is able to accommodate users up to 300 lbs. 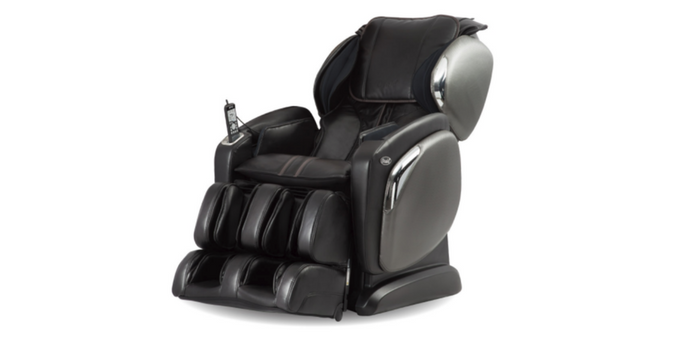 Very similar to the OS-4000LS model, this Osaki massage chair is different by only one feature. It doesn’t offer the reflexology foot massages. Some users may be willing to overlook this downside, but those who are specifically searching for good feet and leg massage, this lack could be a minor disappointment. Apart from that, the OS-4000CS weighs 272lbs. The Osaki massage chair comes from an off-brand company of the same name. The Osaki massage chair is made in China. Note: It is good to know that OSAki & Titan are the same company now. Made of synthetic leather, the chair has a 3-year warranty on parts and labor. Users have the option to purchase the additional warranty; you can find more on their website. We’re not completely sure about the warranty because in some cases the customers stated that their chairs came with a 1-year warranty. The chair can be delivered to 48 states, excluding Alaska and Hawaii. Potential customers are advised to order the additional White glove delivery because the chair is very heavy. The fee would be $250. The chair is delivered in two boxes. The assembly is not too difficult, but the parts are heavy, two people are recommended. You can find the downloadable manual here. Back rollers may not be intense enough for some people. The annoying beeping noise coming from the controller is inexplicable. While it tries to indicate something, which remains unknown, some users were not able to enjoy the relaxing massage because of an occasional beeping sound. According to many massage chair reviews, this is not a matter of being resolved anytime soon. Due to a height issue, we’d suggest potential customers try the Osaki massage chair before purchasing. There seem to be some problems with users taller than 6 ft. They have complained the chair cannot accommodate them properly. Contact the company for additional information on their showrooms. Four popular massage chairs come with four different massage chair review results. The The OS-4000 has the most reviews, and for a budget chair, it offers a surprising number of features, such as automatic leg scan and heat therapy. 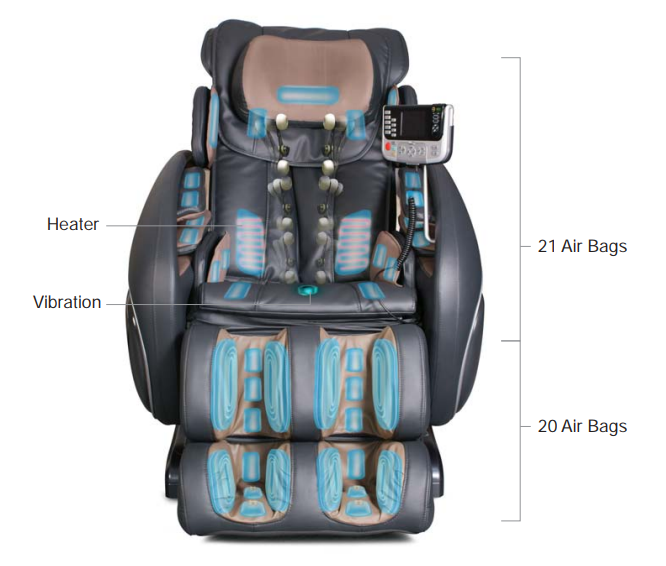 On the other hand, some basic features, such as the L-track design are already available in the massage chairs in the same price range, such as RelaxOnChair MK-II plus, or Kahuna LM6800, which are above all also FDA approved medical devices. The Osaki company might have been too quick to conclude that the customers will be satisfied with less for the same amount of money. The other two models from Osaki, namely the OS-4000LS and OS-4000CS may be what you need in a different price range.